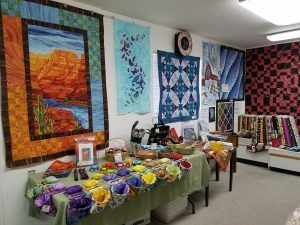 In October, I taught at the Thumb Butte Quilters’ Guild in Prescott, AZ. 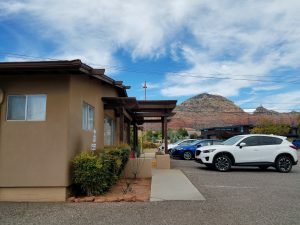 I stayed at the lovely home of the Programs Chair, Kathleen Bond. 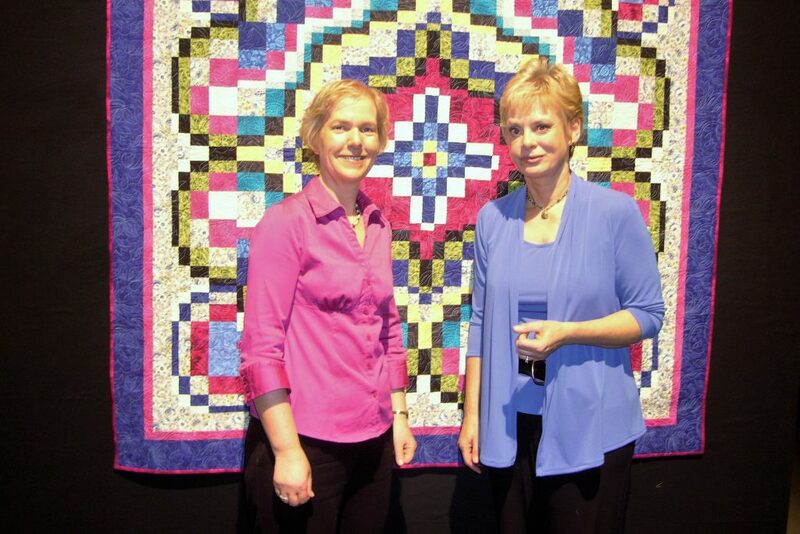 Kathleen has an impressive body of work including many hand applique quilts. 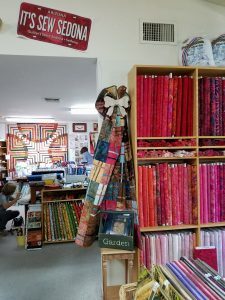 Her fabric choices and combinations are unusual and often very busy, but she has a way of pulling them altogether to make stunning quilts. My next couple of blogs will feature some of her work. 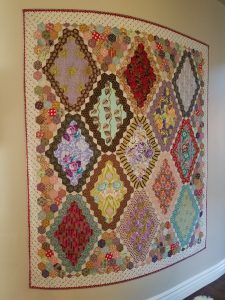 This hexagon quilt was one of my favorites. It was hanging wrapped around a curved wall in the Kathleen’s hallway. 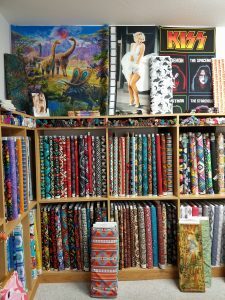 Large print fabrics are featured in windows created by English paper-pieced hexagons with rows of diamonds in between. The pattern is 13 Panel Hexagon Quilt, designed by Brigitte Giblin. 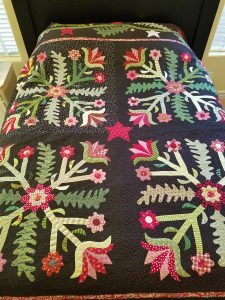 Kathleen made this gorgeous applique bed-quilt using a pattern by Jan Patek. She calls the quilt, Cowboy Christmas because many of the fabrics included are cowboy themed. 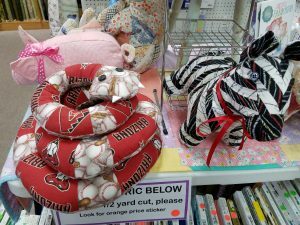 It’s a little hard to see this, but there are fabrics with cowboys on horse back, horse shoes, cowboy hats and boots and more. 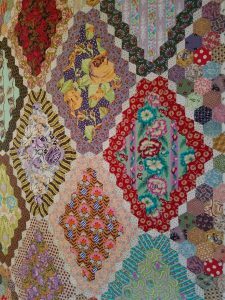 This quilt is stunning from a distance and so interesting close up to see the variety of fabrics used and what is hiding in there. My current major quilting project is a commissioned bed-quilt. 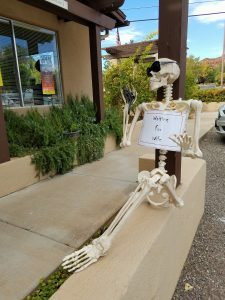 My client is reasonably local, so we have met several times. 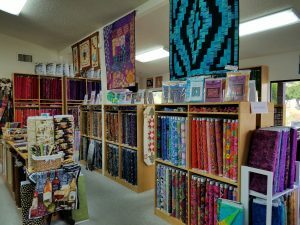 I have been to her house to get a feel for the ambiance and her color pallet and she visited me to look at my quilts and tell me what she liked. 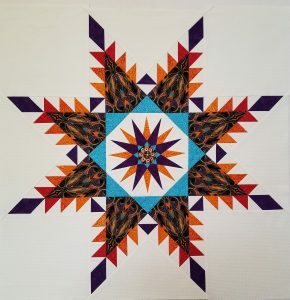 She wants something traditional and geometrical in purple, magenta, orange and turquoise, and was drawn to my Feathered Star quilts. 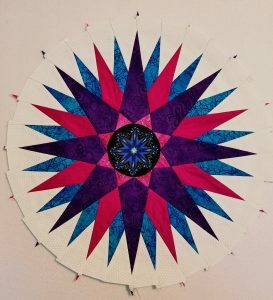 We decided on a large 28″ Radiant Feathered Star for the center of the quilt with a 9″ compass in the middle. I fussy-cut the Paula Nadelstern fabric for the star arms. 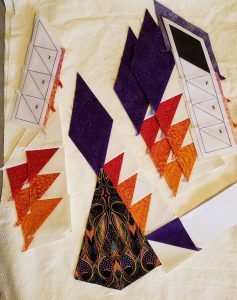 As shown in the photo on the right, the triangles making the feathers are foundation paper pieced and are in a color gradation of oranges. 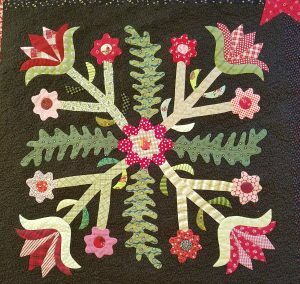 Next, I made four 16″ diamond star blocks, strip-pieced with fussy-cut center diamonds from the same Paula Nadelstern fabric. I’m now working on four compass blocks and have completed two of them. These are 14″ compasses with 32 points. 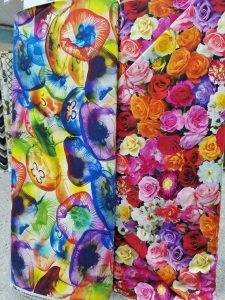 For these, I am using Robin Long’s strip-piecing method and special ruler. Her technique is really slick and very accurate. It took me about eight hours to make this compass including hand-appliqueing the center circle. Check out Robin’s website. 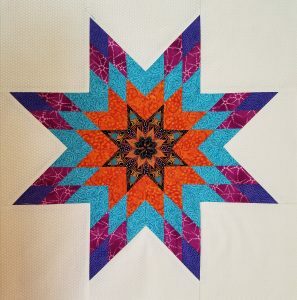 Once all the compasses are finished, I will work out how to put it all together and will be adding smaller Ohio Star blocks between these compass and diamond star blocks. The finished quilt will be in the 80-85″ square size range. In two or three months, I hope I’ll be posting a picture of it!